Our excitement was doubled – for the first time we had family from the USA coming to Honduras. We were headed to the Roatán airport before Grandpa & Grandma arrived to surprise them. Even all that didn’t remove the fear we all had about getting sea sick. In the last post I mentioned I would let you all know if we got sick or not. PUKING DID HAPPEN!! Luckily it was only 2 out of the 5 of us. Unfortunantly for me I was one of the pair spewing our guts out. No lie – it was awful! My youngest daughter and I were sharing a plastic bag we brought with for the just in case. I remember Lily begging, “Mami tell the boat driver to slow down.” I was right there with her on that. I wished desperately we could just stop a moment. To make things a bit more interesting, the plastic bag had a hole in it. I will leave the rest of that senario to the imagination. Right after my video footage was taken I was sick with my baby. Since I couldn’t hold her hair back dad had to do it. We took Dramamin but it did nothing for us. I should have used my Psi bands – The only reason I didn’t was fear I needed something stronger. No luck! On the way back from the island I did use my bands and I wasn’t sick at all (review to come). Lily & I couldn’t have been happier to get off the boat. 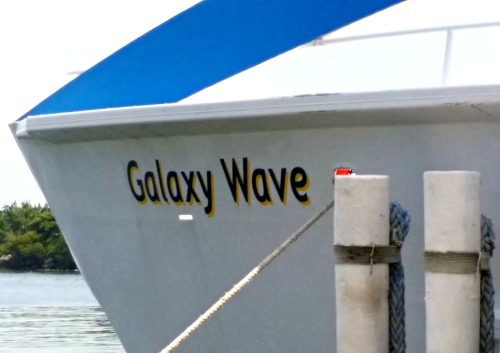 The Galaxy Wave is operated by Safe Way Maritime Tranportation. A round trip ticket for an adult costs $61 and a child’s fare is half. A helpful tip – you can pay in either dollars or lempiras. The ferry ride from La Ceiba Honduras to Roatán is about 70 minutes, maybe a few mintues more. My husband parked our truck at the port’s (on the mainland side) secured parking area. For ten days we paid $60. Some how we paid less than I thought it would be. My understanding was a $100 payment was needed. Either way the cost was reasonable for being convient and most of all SAFE. The ferry only travels twice a day. We had traveled from home the night before in order to board at 9:30 am. The next time you can travel over from the mainland is at 4:00pm. 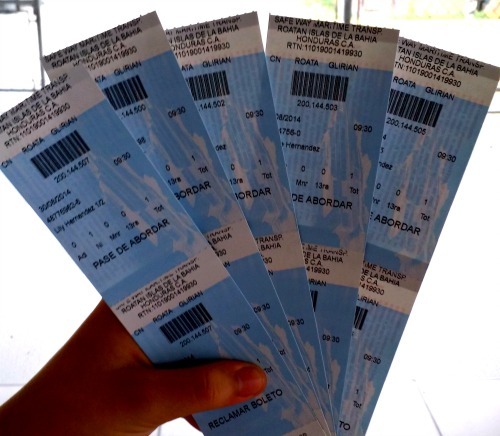 Coming back from Roatán travel times are 7:00 am & 2:00 pm. We did check in an hour before as recommended. Easy as pie, even with kids. The only complaint I have is not being able to pay online. Instead of carrying the cash it would have been nice to pay online. The site says you can book tickets, but that was not the case. I called their office with all of my questions well in advance of our travel days. I made sure to ask about purchasing tickets ahead of time. The nice lady on the phone explained they were not set up at this time to except payment online. Not sure why it is offered when in reality it is/was not doable. 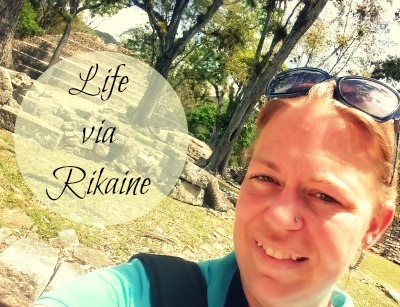 Traveling from La Ceiba Honduras to Roatán is really very easy, plus afforable. If we had wanted to travel by plane the tickets at that time would have been $200 per person. For our family of 5 it would just not have been economical. Travel times are daily, making it possible to head over when ever you want. The view is amazing over the open water, something my entire family will never forget. Despite getting sea sick I would definitley do it again! Have you ever traveled by ferry? What was the best and/or worst part about your water travels?